The Church of England in the West Midlands is lightening up its season of Lent with the opening of a comedy club. 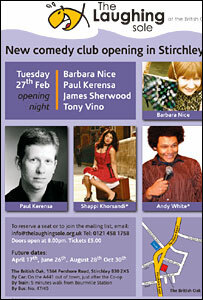 The Laughing Sole, in Stirchley, Birmingham, is billed as a "Christian-run comedy club with a cleaner, less offensive ethos". It opens next week and is part of the Birmingham Diocese's Love Life Live Lent2 campaign. Lent starts on Ash Wednesday and is traditionally a sombre 40-day period of abstinence and fasting. Club founder Helen Tomblin said she believed there was a gap in the market for a club with a cleaner ethos. "If you cut out the swearing and crude material you actually get a higher standard of comedy," she said. "Humour breaks down barriers, relaxes people, builds community and often prompts conversations about life, meaning, morals and maybe even God." Last year, 70,000 people joined in Birmingham's Love Life Live Lent series which centred on a series of 50 positive actions to encourage kindness and generosity. The programme is being run nationally this year with about 200,000 expected to take part. The second series focuses on being good neighbours with a text messaging service being launched which will send daily suggestions on how to spread neighbourliness. The Bishop of Birmingham, the Rt Rev David Urquhart, said: "Laughter is essential for our life together as the Body of Christ and I am convinced the first disciples and apostles would not have stuck together through those years of intense joy and suffering without a good deal of fun and laughter."